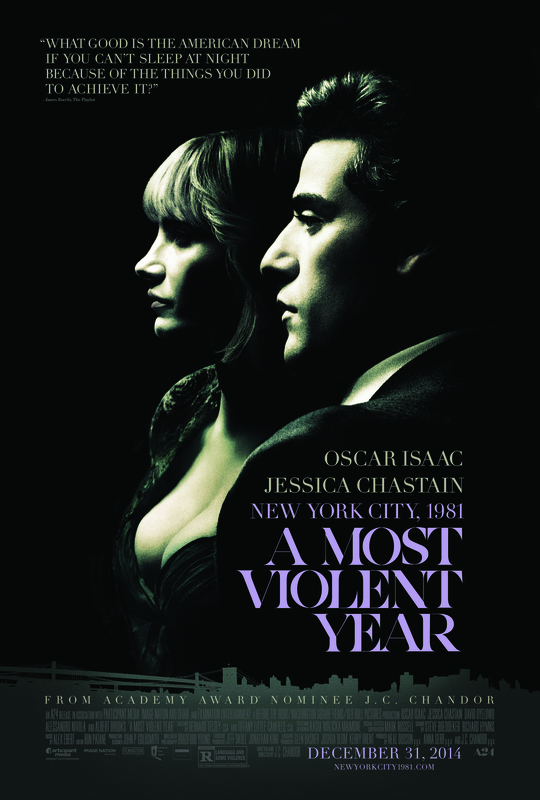 A Most Violent Year is another ambitious film directed by J.C. Chandor. Chandor, who has a thematic affinity for modern market capitalism and the American Dream, is the new Oliver Stone of today. Margin Call, Chandor’s Wall Street, is a riveting first feature about the financial crisis in 2008, which coincided with the Occupy Wall Street movement. Now with his third film, A Most Violent Year is simultaneously nostalgic and foreboding of a supposedly simpler time in America’s economic climate. While Margin Call focuses on the removed corporate machines whose decisions exploit and affect the marginalized, A Most Violent Year is a personal examination on the American family and their pursuit of the American Dream. If Margin Call is Chandor’s Wall Street, then A Most Violent Year is his The Godfather, at least in spirit. I believe The Godfather Part 1 and Part 2 are the pinnacle films that critique American capitalism, the American Dream, and the family. The Godfather brings into question the fundamental values rooted in American ideology. While Vito Corleone embodies the immigrant and rags-to-riches narrative, after all there is nothing more American than the immigrant story, the Corleone family is also a synecdochical reference of corporate America and its contentious history. Chandor continues this exploration but on a smaller scale because unlike Don and Michael Corleone, the protagonist of A Most Violent Year tries to play within the boundaries and confines of the game. The hero of A Most Violent Year is Abel Morales. Abel runs a heat oil company and is in the process of risking his family’s entire fortune to expand his business. Abel drops a significant down payment for a port property owned by a Hasidic Jewish family. When asked why he didn’t accept an offer on a lease, Abel responds, “I like to own the things I use.” As part of the agreement, Abel has a month to gather enough investors to pay off the rest of the property. If not, he stands to lose his entire fortune. Meanwhile, just as Abel is making this significant gamble, one of his oil trucks is hijacked and stolen. Julian (Elyes Gabel), one of the drivers, is severely beaten. While Abel’s composed demeanor suggests otherwise, he is simultaneously concerned about the safety of his workers and the well-being of his company. With each ensuing hijack, Abel begins to suspect foul play from one or all of his competitors. More importantly, Abel is losing leverage on garnering investors, thus threatening his entire livelihood. As if Abel doesn’t have enough on his plate, Lawrence (David Oyelowo) the ambitious district attorney is investigating the company for business irregularities. Anna (Jessica Chastain), Abel’s Lady Macbeth of a wife, wants him to take a more aggressive approach to protecting his family and his company. Anna and Bill, the teamster captain, want the drivers to be armed with handguns to protect themselves. Not wanting to be a “gangster,” Abel resists. This is the central moral argument that persists throughout the film. While Abel channels the persona of Michael Corleone, Abel comes across as an honorable and ethical man, sometimes to a fault. He hates guns and violence. In a telling scene, Abel hits a deer with his car but is unable to put the animal out of his misery. We believe him when he tells the D.A. that he runs his business within the confines of the law. It is his competitors that have poisoned the well, but he is paying the price. Like Anna, we are left frustrated by Abel’s seeming inaction. We expect and want Abel to get his fingernails dirty. Isn’t that why we love characters like Don Corleone? But what does this reveal about us? While Abel does come across as a caring and sympathetic boss, at least more so than what we are accustomed to, he is still nevertheless a businessman. I won’t spoil the ending but I will say Abel, in his own calculating and connicing manner, is guilty of being shrewd and merciless. To see Abel juggle with the ethical and moral boundaries of business is ultimately what makes the film thrilling to watch. It also helps that Chandor has put together an amazingly talented cast and crew. Shot by Bradford Young and scored by Alex Ebert, A Most Violent Year channels the influence of The Godfather in its veins. The dark warm palette pays homage to the great Gordon Willis. The film is visually astounding. The score is foreboding and urbanized, which, at times, is eerily reminiscent of Nino Rota’s work. Chastain, who manages to pull off a Brooklyn accent, delivers another commanding performance and proves she is one of the top actors today. As a matter of fact, she is a bit under utilized. Albert Brooks, who plays Abel’s lawyer, is always a treasure to watch. Oyelowo, who was unapologetically robbed of an Oscar nomination for Selma, steals every scene he is in. The film triumphs though thanks to Oscar Isaac’s sublime performance. With Inside Llewyn Davis and A Most Violent Year under his belt, Isaac has this odd ability to command the screen with a fierce passivity and boiling gentleness. It is rather unsettling. This is fitting for a man like Abel, who not only faces moral dilemmas, but is also a man up against the ropes because of unaired racial expectations. With Abel as his poster boy, Chandor seems to suggest a more optimistic view on the American dream. However, I argue the film remains skeptical about it as we see Abel’s principle buckle under the unrelenting force of the systemic mechanization of capitalism. While Abel manages to retain his humanity, there are other factors that are compromised. Abel spends a fortune to purchase a beautiful home but the safety of his family is still in question. Abel, who in one scene reminds Julian to speak in English and not in Spanish, has to negotiate with his own marginalization as a Hispanic man. The film’s focus on the paradoxical progression and regression between capitalism and the family brings into question the mythology of the American Dream. The film may not be in the stratosphere of The Godfather, but I still commend and applaud Chandor for continuing to challenge the American way of life.